followed by Youngstock Evaluations for filly, colt & gelding foals, yearlings and 2 year olds plus 3 year old geldings and fillies. * Note that youngstock & mare entries for Moulton College will be limited & accepted on first received basis, as stallion grading at this venue will take priority. 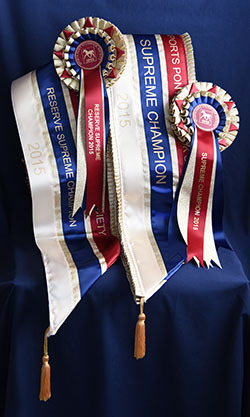 The 2016 Supreme Champion and Reserve will be selected by the Evaluation Judges after all the Evaluations are complete. There will also be special rosettes and certificates for the Top Pony, Top Small Horse, Top Colt, Top Gelding, Top Filly, Top Foal, Top Yearling, Top 2 Year Old and Top 3 Year old. The Evaluation score will be the primary factor in deciding the results with the judges deciding in cases of equal score. The Regional Youngstock Evaluations are open to filly, colt and gelding foals, yearlings & two year olds (plus 3 year old fillies & geldings) bred to be competition ponies or small competition horses (up to 158cm unless SPSS passported when there is no height limit) regardless of breed, passport or colour. Each entrant will be evaluated individually for conformation and paces (in-hand & loose) with loose jumping as an option for those 2 and 3 year olds destined to be show jumpers or eventers. With our regular grading judge, Hans-Heinrich Brüning, flying in from Germany for all of the regional evaluations, all participants will get a mark/comment sheet (sent after the event) and those gaining at least 7.0 will be awarded a Premium Rosette unless they score 8.0 or higher when they will get a Gold Premium Rosette. Youngstock do not have to be SPSS registered nor do owners have to be SPSS members. The lead judge at all the evaluations will be Herr Hans-Heinrich Brüning. Hans-Heinrich is a well known German judge and breeder of Hannovarian dressage and jumping horses at his family farm, Hof Brüning, which is well-known for its solid preparation work of horses for licensings, mare shows, stallion and mare performance tests as well as auctions, shows and championships. Hans-Heinrich has judged at the SPSS mare and stallion gradings since 2010. September evaluations - click here to download the Entry Form. October evaluations - click here to download the Entry Form. Early entry is advised as spaces will be allocated in order of receipt of entries and once capacity is reached at each venue further entries will be placed on a waiting list. If there is space, late entries may be taken, please call the office on 07703 566066 to check. Late entry supplement £5 per pony. The SPSS Rule book can be download here. Specific rules for the Youngstock Evaluations and National Final can be found in the schedule & entry form. See schedule & entry form for withdrawal policy. For more information about the evaluation process, turnout etc, please see the Info & FAQ page (here). We have booked a photographer for each venue; details to follow.